FlexiTrade Canopy: From $2089.00 installed! In the market for a Canopy? Flexiglass are offering 10% off all FlexiTrade canopies ordered in the month of May. 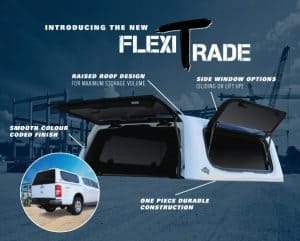 Whether you’re off camping, fishing, taking the dogs to the beach or loading up your tools for work, the FlexiTrade canopy is a versatile, cost effective way to get the most out of your vehicle. Colour coded to your vehicle and backed by a 2 year nationwide warranty, there’s a FlexiTrade canopy to fit just about every make. From $2089.00 installed. Standard features for the FlexiTrade Canopies include: Large sliding windows OR Large lift up windows with twin locking handles; Single handed slam lock rear door; Smooth colour coded finish; Raised roof for maximum storage; Tinted safety glass; Felt lined interior; LED battery powered “on/off” interior light; and, Flush fit LED rear brake light! You can get this special offer right here @ Midland Towbars! Mention this promotion to redeem your special price. 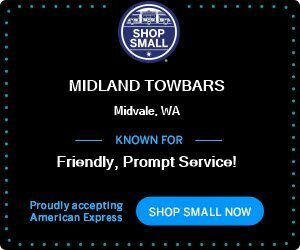 @ Midland Towbars now on 08 9250 1230! We are also proud to accept you racking up your points on your Amex Card 😊 Give us a call today to discuss our huge range of products that we now can supply and fit to “dress up your vehicle”.